Scottish airline Loganair will take over the former Flybmi route from City of Derry Airport to London Stansted from 27 February. It follows the collapse of Flybmi, which had operated flights between the airports since 2017. The airline filed for administration and ceased operations last Saturday. Loganair's managing director Jonathan Hinkles said the airline was "extremely pleased" to have been selected. Emergency talks began between the Department for Transport, City of Derry Airport and Derry City and Strabane District Council, which owns the airport, in the wake of the Flybmi collapse. Mr Hinkles said Loganair was selected after a "competitive tender process". "I know the news about Flybmi created great uncertainty so we're focused on recommencing operations as quickly as possible," he added. The public service obligation (PSO) air route, the first of its kind in Northern Ireland, had been in place since 2017. It had been due to expire in May but Transport Secretary Chris Grayling last week said the government would continue to subsidise the route until 2021. On Thursday, Mr Grayling said securing Loganair was "testament to the hard work of Derry and Strabane Council, the City of Derry Airport and my department". "This route is vital because it strengthens the union, protects choice and boosts trade and travel opportunities , enabling business trips to and from Derry-Londonderry within a day," he said. 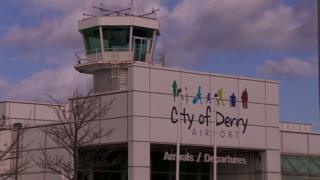 Clive Coleman, the contracts director at Regional and City Airports, which runs City of Derry Airport, said maintaining a London route "is vitally important for the airport and for the economic development of the north west". "We are delighted to have Loganair on board to operate the London Stansted service," he added. "Because this is a public service obligation route if the operator fails you are allowed the award the contract for a period of seven months, which is what the council has done. "During that seven months though you have to retender with a full procurement exercise and we'll be starting on that work in the next couple of weeks. "So it's for seven months - we can't do it for any longer than that, that's the EU rules. "It's called an emergency contract under those regulations." Loganair will operate a twice-daily service from 27 February. It already operates a Derry-to-Glasgow service. Gareth Scott from trade union Unite said the announcement would be "a huge relief to those who feared for their jobs" after the collapse of Flybmi. He said the Stansted route is central to the airport's long-term viability. "This provides the perfect spring-board for City of Derry to seek additional flights into the airport and securing its place as a leading regional air hub," he added.